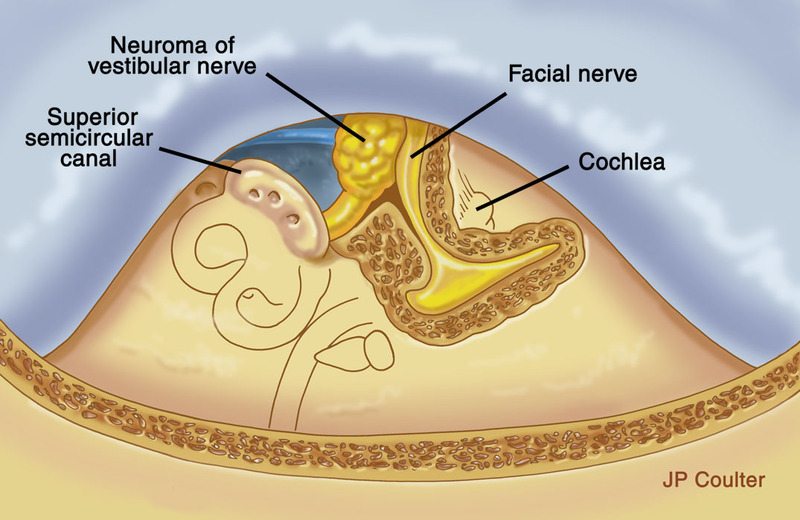 Acoustic neuromas can be managed in a number of different ways. Each method has its own inherent risks and benefits. Age, size of the tumor, history of growth, status of hearing and balance function, and associated medical problems are all important factors in determining the method of management. Our philosophy varies according to the size and location of the tumor. 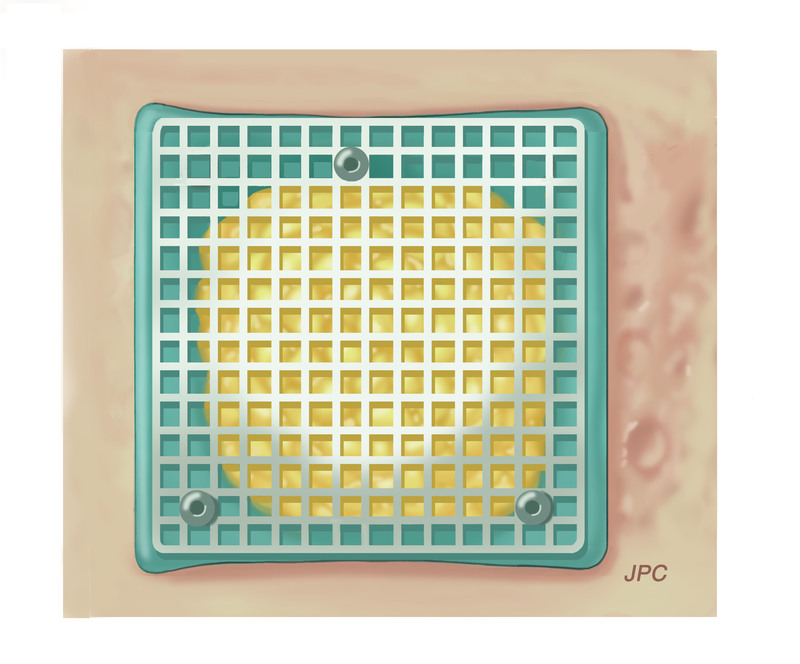 Small tumors within the internal auditory canal can be managed conservatively. If these tumors begin to grow or cause disequilibrium that is disabling, then surgical management may be necessary. In selected cases, radiation therapy may be indicated. Larger tumors that compress the brainstem, especially the cystic tumors, require surgical excision. Some of these tumors can be followed with imaging done every six months to determine the growth rate of the tumor. Again, this growth rate may not follow a linear curve. A long period of no growth can be followed by rapid growth over a short period of time. The risk is additional hearing loss in the involved ear. This hearing loss is permanent. Additional growth of the tumor may make it more difficult to surgically dissect it from the facial nerve or brainstem. Several types of delivery systems have gained popularity. Gamma Knife, also known as stereotactic radiosurgery, is one example. Other modalities include the Cyberknife and Linac systems. These names are really misnomers because the radiation treatment involves no surgery. High dose radiation is delivered to the core of the tumor in an effort to slow down growth. This is a one-day treatment. Radiation does not kill the tumor cells, but rather induces fibrosis and scar tissue that contains future growth. 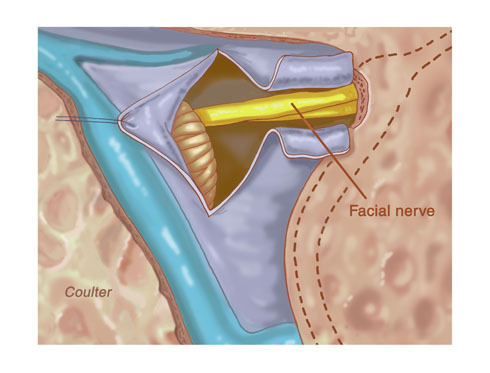 In the process, the facial nerve becomes scarred into the tumor. The downside of this treatment is that if the tumor begins to grow after having had radiation, surgery may be required to excise the tumor. The complications from surgery are greater if prior radiation treatment has been rendered. It is surgically more difficult to dissect the tumor from the facial nerve or brainstem after having had radiation treatment. Healing is also impaired, and spinal fluid leaks are more common. There is also a chance of facial paralysis with radiation treatment alone. Not all tumor sizes are amenable to radiation treatment. However, we do offer radiation treatment for certain patients. Individuals with small, actively growing tumors who cannot undergo surgery because of other medical problems or patients with small actively growing tumors and advanced age are excellent candidates for this treatment. Radiation therapy does cause mutations. These benign tumors can become malignant following treatment with radiation. 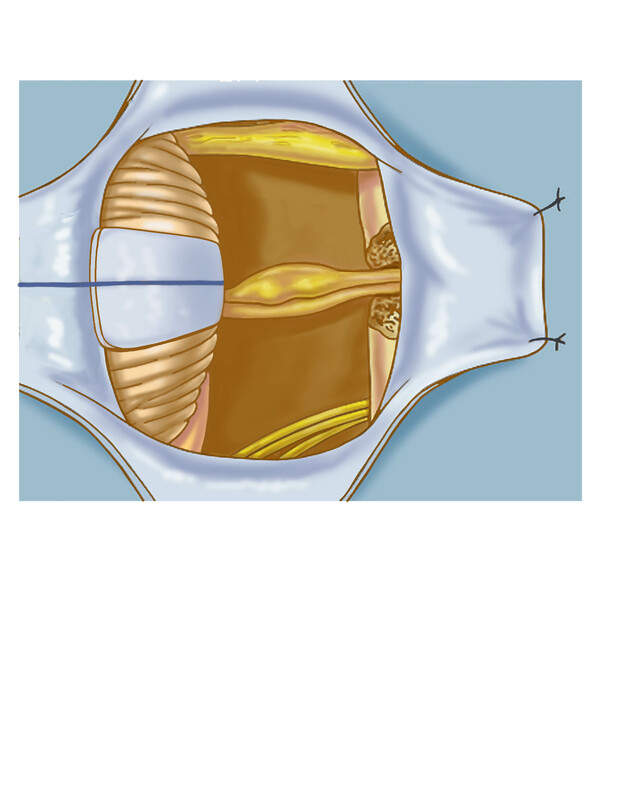 Acoustic neuroma surgery is done under general anesthesia. Typically, a patient will spend the first night after surgery in an intensive care unit and be discharged from the hospital two to five days following surgery, depending on the postoperative course. 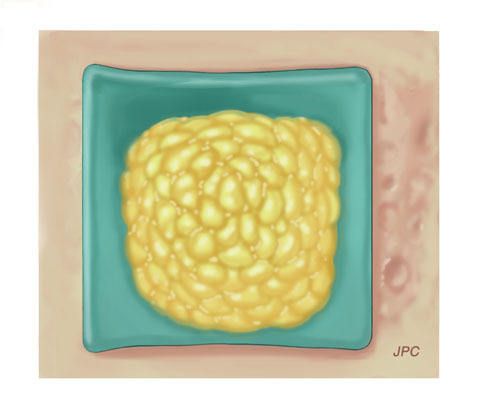 Generally, small and medium-sized tumors can be removed with one operation. 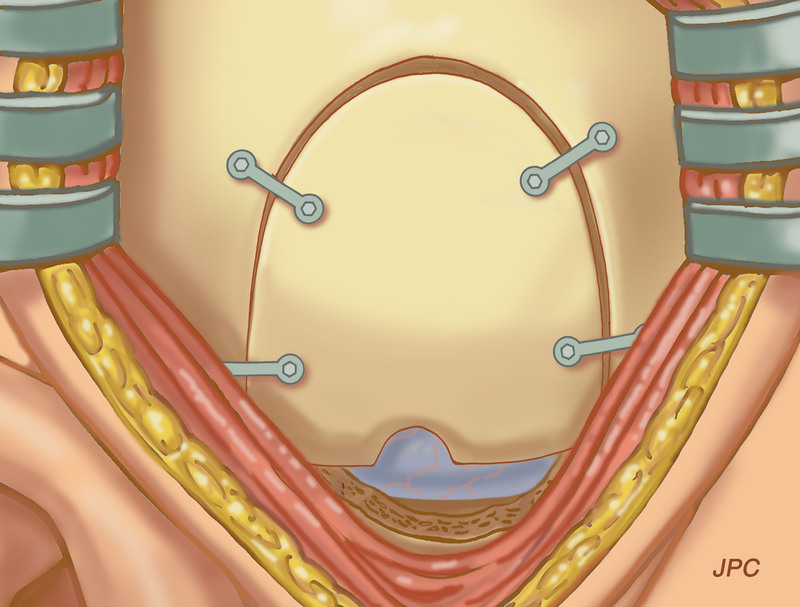 Larger tumors may require two or more operations. In order to preserve hearing during surgery, the hearing can be monitored during the course of surgery using auditory brainstem response monitoring. An auditory brainstem response is a special hearing test done while a patient is hearing clicks or discrete tone bursts. Electrodes around the scalp detect waves that are generated from all parts of the brain. The waveforms are filtered so that signals generated by the clicks or tones are amplified while all other extraneous signals are computer-averaged out. This produces a tracing showing five discrete waveforms, each of which corresponds to a specific part of the auditory pathway from the inner ear to the brainstem. Normally, waves I through V occur one to five milliseconds after the click or tone is heard. 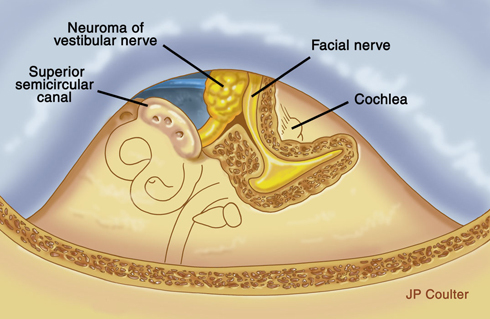 The presence of an acoustic neuroma may slow the transmission of the click or tone so that these waves occur at much later times. The neuroma may also dampen the amplitude of the waveform to the point where it may completely disappear. During tumor dissection, the presence and timing of the waveforms is what is monitored. 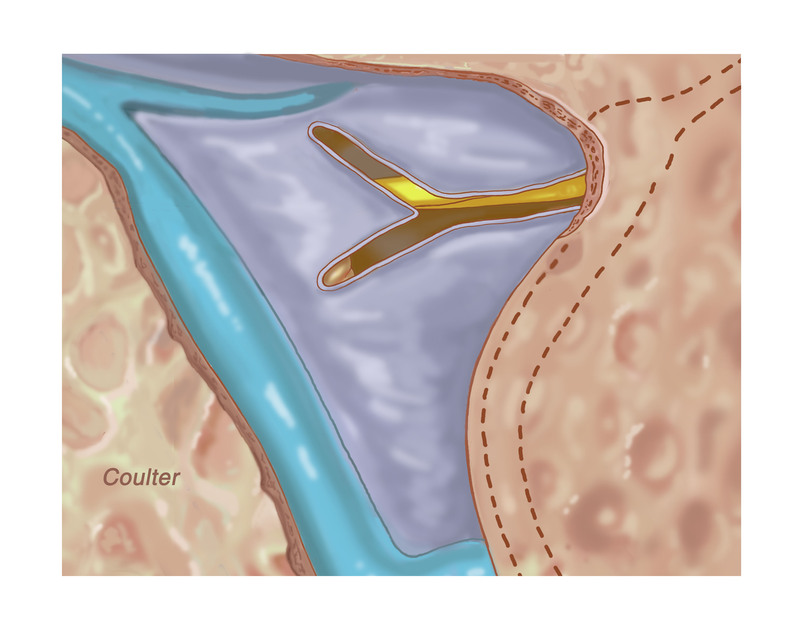 Generally, if the waveforms are lost during surgery, the hearing has also been lost. Just like hearing, the status of facial nerve functioning can also be monitored. Under general anesthesia, recording electrodes are placed in the facial muscles. These electrodes detect contractions of the facial muscles, and the signals are transmitted to a speaker so the surgeon may hear the responses. Contractions can be generated by tumor dissection from the facial nerve. Facial nerve monitoring is also helpful in preventing facial nerve injury from manipulation of the tumor. 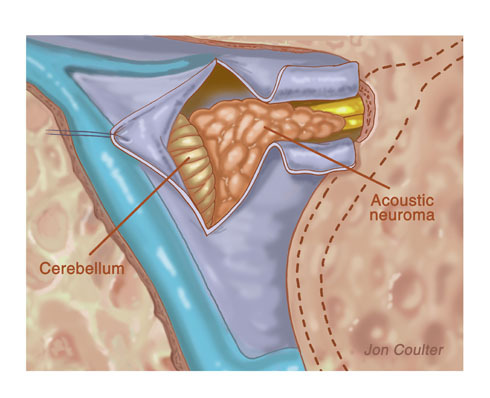 An operation to excise an acoustic neuroma involves three phases: an initial approach to allow visualization of the tumor, tumor removal, and then closure of the wound. There are three approaches or avenues around or through the inner ear that allow adequate visualization for tumor removal. Each has its own benefits, risks, and consequences. They are the translabyrinthine approach, the suboccipital approach, and the middle fossa approach. This illustration shows the layers of the skull. In order to understand the surgery, one must comprehend some basic anatomy. Under the scalp is the bony skull. Under the bony skull is a tough fibrous layer of connective tissue called the dura. 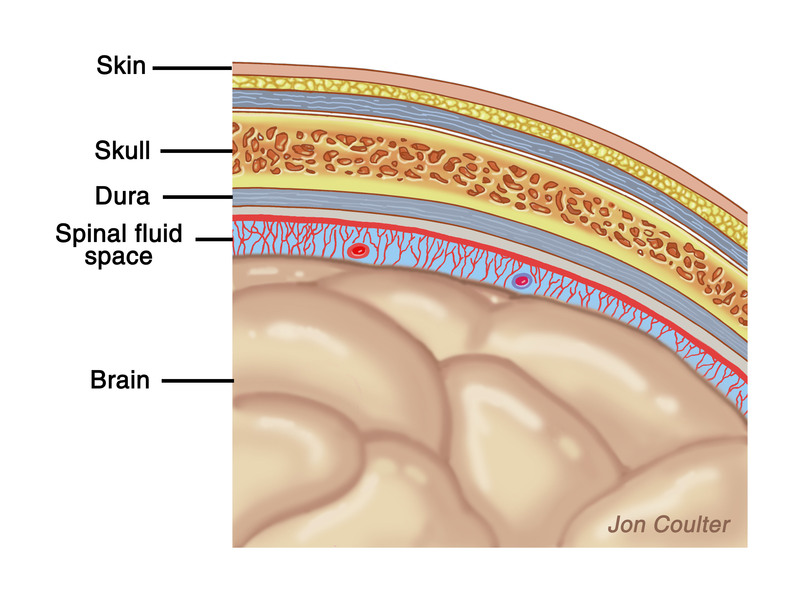 Within the dura is the brain that floats in a fluid medium called spinal fluid. Spinal fluid bathes the brain and circulates within the brain, functioning to protect the brain from trauma. The spinal fluid is also responsible for providing nourishment to the brain. Step 1: A translabyrinthine approach to excision of an acoustic neuroma is illustrated. 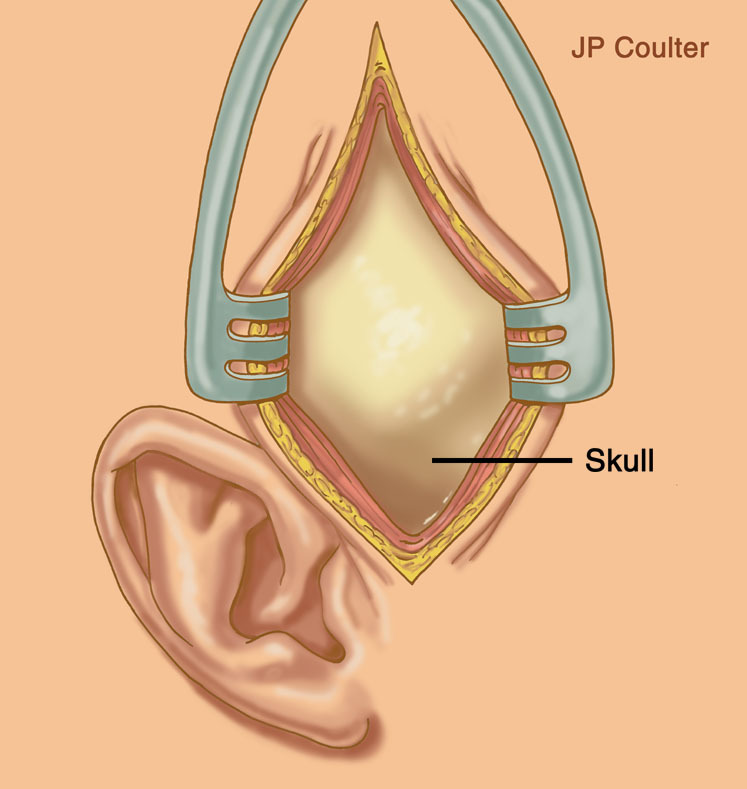 An incision is made behind the ear. Step 2: The mastoid bone and surrounding muscles are exposed. Step 3: A mastoidectomy is performed exposing the semicircular canals, venous sinus, dura covering the brain, and spinal fluid. The semicircular canals are removed exposing the internal auditory canal. Step 4: The tumor is exposed and the dura of the internal auditory canal is opened. 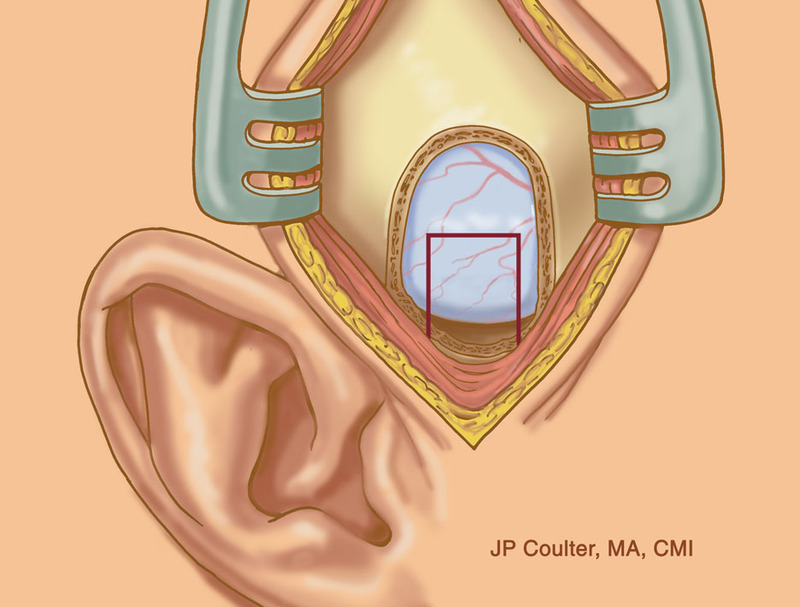 Step 5: The tumor can be seen extending into the internal auditory canal. The trigeminal nerve that is responsible for transmitting information on facial sensation is displaced. The central portion of the tumor is gutted out allowing the capsule to collapse on itself. Step 6: The capsule is then dissected away from the facial nerve. Step 7: The dura is laid back in place. Step 8: Silastic sheeting is placed. Step 9: Fat harvested from the abdomen is used to fill the cavity to help prevent spinal fluid leakage. Step 10: A titanium plate is then laid over the fat. Step 11: The incision is sutured. Step 1: A suboccipital approach to excision of an acoustic neuroma is illustrated. 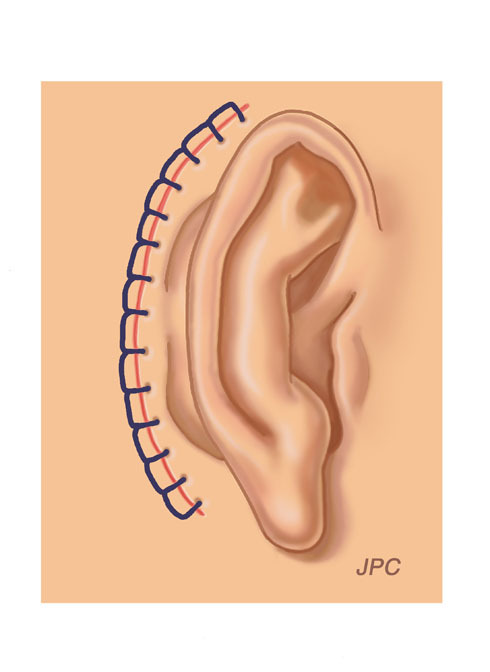 An incision behind the ear is made. Step 2: The bone over the brain is exposed and a rectangular piece of bone is temporarily removed. The dura and the venous sinus are exposed. Step 3: The dura is then opened and spinal fluid is drained to allow brain relaxation. Step 4: The tumor and the trigeminal nerve are exposed. The trigeminal nerve transmits information related to facial sensation, not motion. Step 5: With the use of a CUSA, the central portion of the tumor is gutted out, allowing the capsule to collapse on itself. The bone over the internal auditory canal is removed and the dura is opened, exposing additional tumor. Step 6: The capsule is then dissected from the uninvolved vestibular, cochlear and facial nerves. The dura is then closed. Step 7: Silastic sheeting is placed and a titanium plate is secured in place. 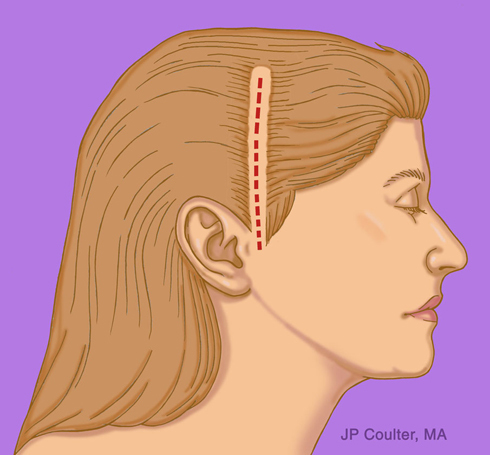 Step 1: A middle fossa approach to excision of an acoustic neuroma is illustrated. 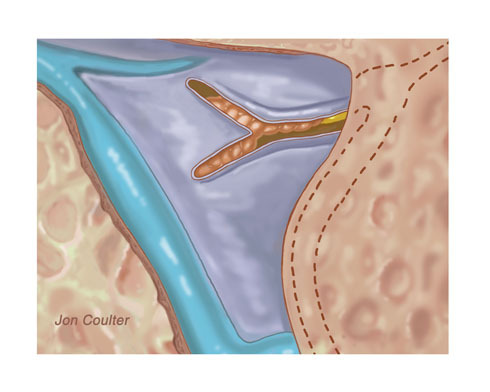 An incision is made in the scalp above the ear. A number of other incisions may also suffice. Step 2: The skin is pulled back exposing the temporalis muscle underneath. Step 3: The temporalis muscle is pulled down exposing the bone over the brain. A rectangular piece of bone is temporarily removed off the dura, the covering of the brain. At this point, some spinal fluid is drained from a catheter placed in the back. This allows the brain to relax. Step 4: Additional bone at the base of the brain is removed. The square shown is enlarged in the next diagram. 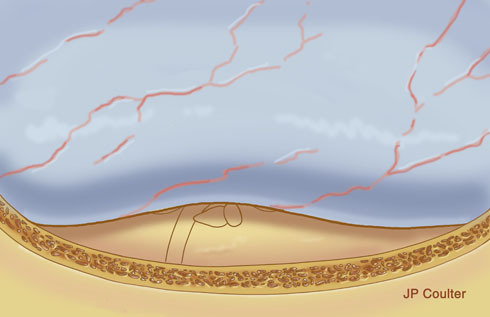 Step 5: The structures at the base of the brain are exposed. The roof of the internal auditory canal is removed and the dura within the canal is opened. 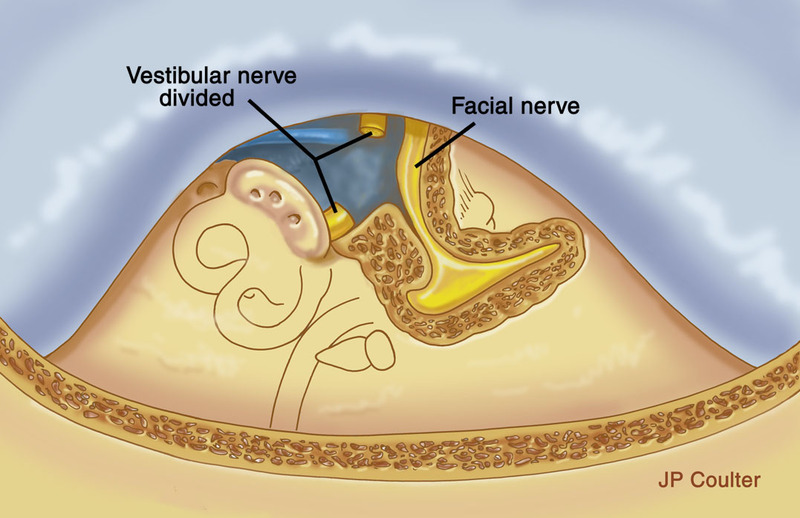 The facial nerve and the tumor involving the vestibular nerve are exposed. 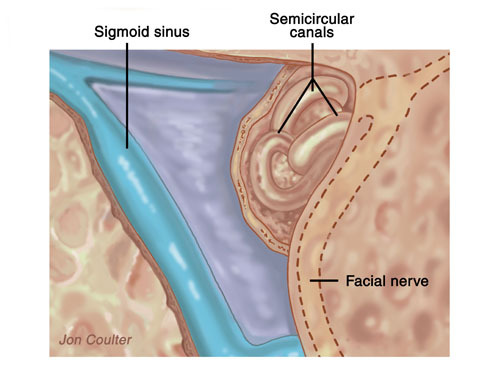 Other structures seen are the superior semicircular canal, malleus and incus. Step 6: The tumor and the vestibular nerve are dissected from the adjacent facial nerve and removed. 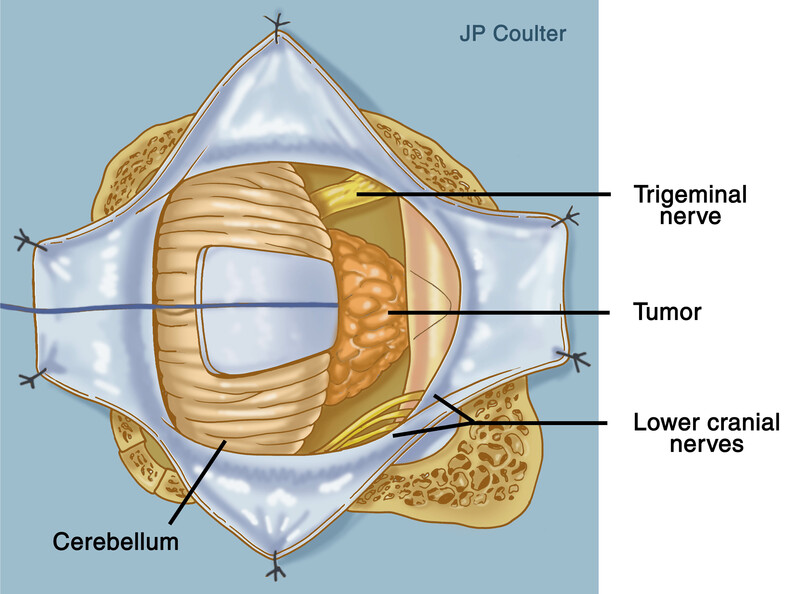 On rare occasion, the tumor can be dissected from the vestibular nerve. Step 7: The dura is placed back into position. Step 8: The small portion of bone that was removed is placed back into position and secured. Step 9: The incision is sutured. Which approach is used for which tumor? Guidelines for which approach is used for each tumor vary according to the size of the tumor, the status of the hearing present, and the degree of experience of the surgeons. We prefer to use the middle fossa approach with small tumors within the internal auditory canal when the patient has good hearing. 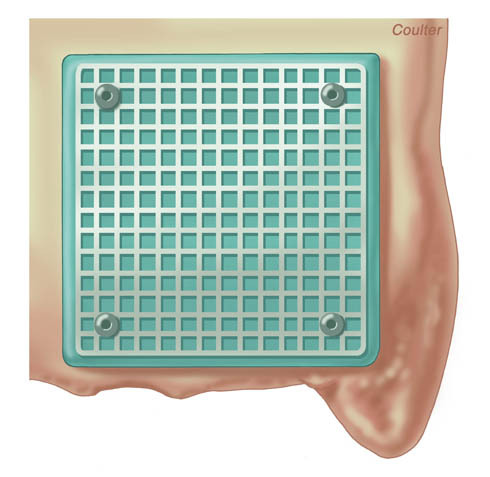 The translabyrinthine approach is preferred when the patient has no useful hearing. 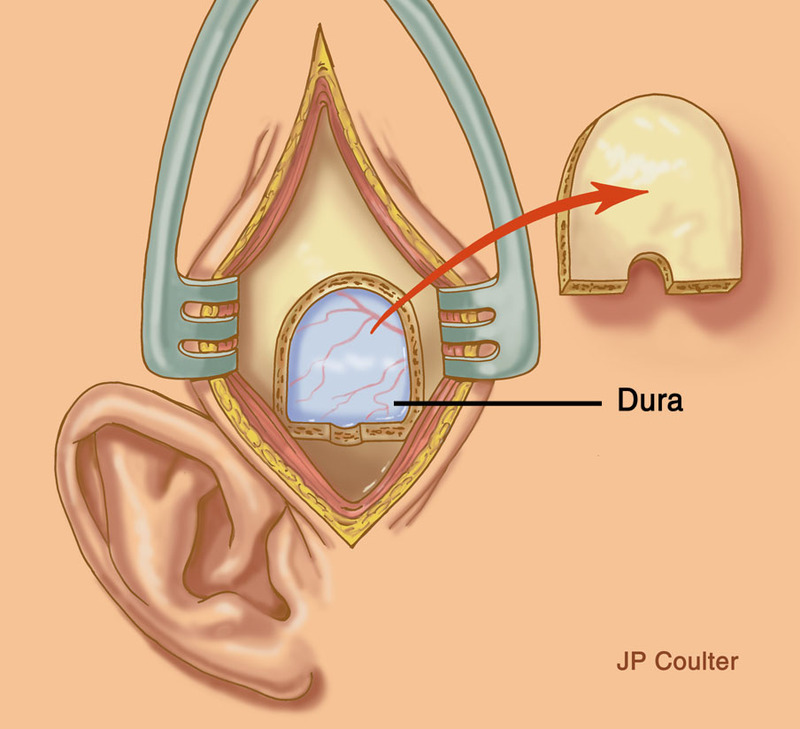 When tumors become larger than 2.0 cm, the chances of preserving hearing are almost nonexistent. 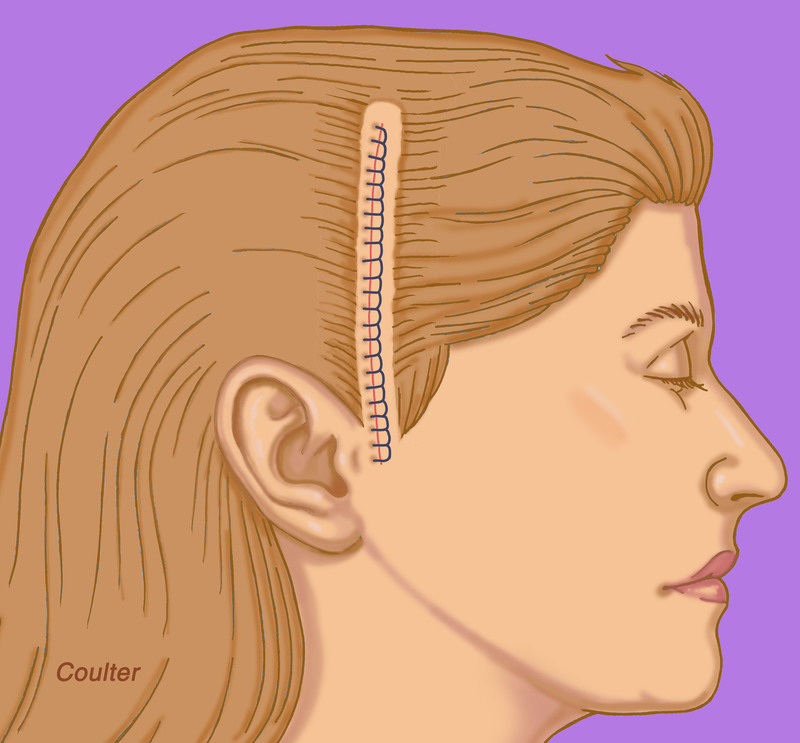 Either the translabyrinthine or suboccipital approaches can be used for these tumors. What is Our Technique of Tumor Removal and How Is It Different from Other Surgeons? 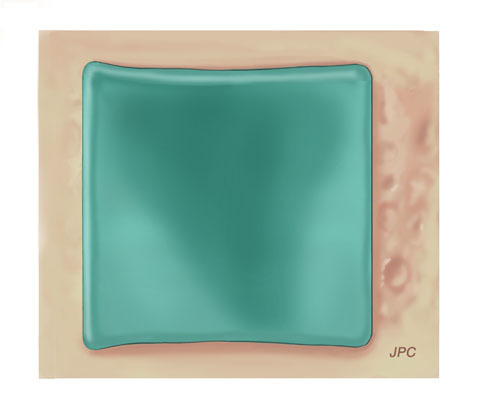 The technique of tumor removal is the same in all three approaches. The central portion of the tumor is first removed either mechanically with instruments or with a special tool called a CUSA. The CUSA is an instrument whose tip vibrates at a very rapid rate. The tumor cells within the core of the tumor are vibrated loose. 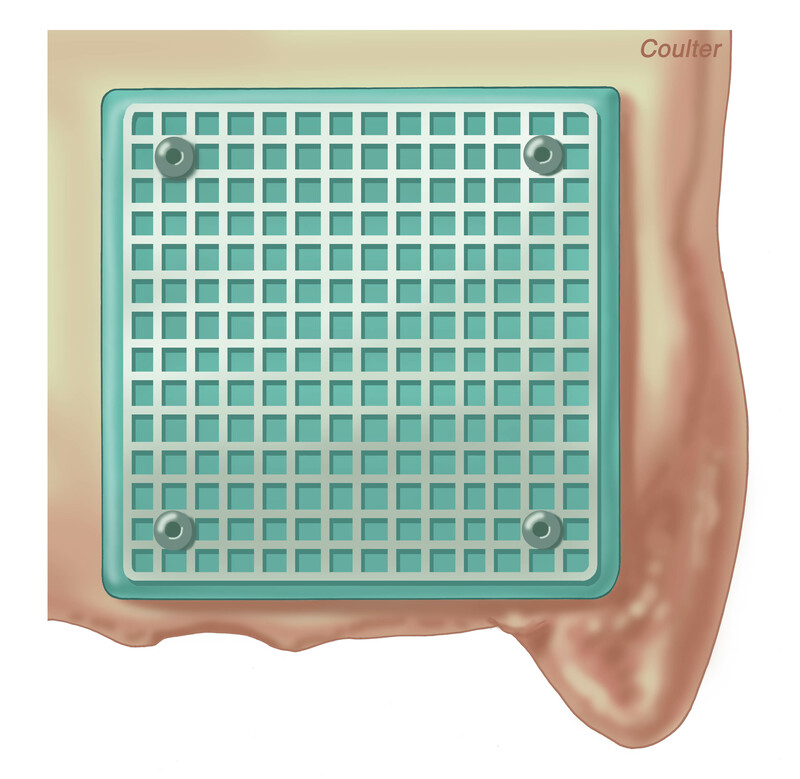 A cavity is created as the tumor cells are constantly irrigated and suctioned away. The capsule of the tumor is then dissected from surrounding structures like the facial nerve, cochlear nerve, and brainstem. In most cases, both the superior and inferior vestibular nerves are removed with the tumor. No retractors are used in our technique. This diminishes the risks of injury to the brain. Many surgeons use retractors that can cause swelling, bleeding, and other complications of the brain. We do not remove parts of the brain to better visualize the tumor. It may sound ludicrous; however, many surgeons remove parts of the cerebellum to expose the tumor. Many surgeons claim that parts of the brain can be removed without any deficit. This is not true. We have performed over 500 successful surgeries over a 20 year period. We are not in the business of training medical students, residents, or fellows. Doctors- in-training will not be operating on you.